Where’s the new album hiding? 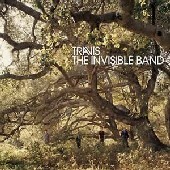 The Invisible Band is the 3rd album from the Scottish songsters, and following on from the success of "The Man Who…" presents something of a challenge to Travis. The album opens with a catchy little song, Sing, earmarked as the first single, which features a jangly banjo sound behind Fran’s melodic voice. Nice. And the album promptly follows suit: elemental and delightful, but not very ambitious. Perhaps the only diversion from this level path is the fantastic Side, which sulks through it’s passage like a neurotic scud missile: powerfully obsessive, with great pace. Talking of neurosis, another stock song, but a decent one, is Dear Diary – a forlorn, manic, admission – which changes the pace early in the album. These two songs are unfortunately so near the beginning that they leave you waiting for the rest of the album to ‘happen’. Ultimately The Invisible Band is a very truthful, honest, sincere, adept album that’s well worth the admission money, but is really a somewhat standard fayre. Not a masterpiece, it is simple and refreshingly unpretentious, but it does leave you sensing that there’s something more interesting lurking inside them.